After a rainy spring & hot summer, most people are ready to give up on yard work by October. After all, it’s more fun to watch football in a warm house. However, autumn is the best time of year for most landscape projects. 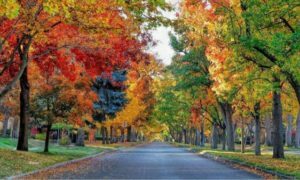 A healthy, attractive landscape next season starts with the things you do this fall. Fertilize – the 3 numbers you see on every bag of fertilizer is “NPK,” nitrogen (N), phosphorus (P), & potassium (K). They are essential for plant health. Use fertilizer that is low in N & higher in K. This prevents unnecessary late-season growth while helping build roots & cell walls. This enables your plants to better endure unpredictable winter weather & readies them for spring. Aerate – this removes plugs of soil & thatch from the lawn which opens up pockets for root development. It also reduces compaction for better use of water & fertilizer. Warning – don’t aerate if your sprinkler lines are shallow (buried less than 4″ deep). A properly installed sprinkler system should be well below the impact zone of an aerator. Sadly, some systems are hastily installed with little consideration to pipe depth. Prune – chances are your trees & shrubs got quite shaggy over the summer. Now is the time to tame them. When making proper cuts, you can reduce their size by up to one-third. It’s also time to cut down spent perennials. Wait until they’re yellow & laying on the ground. This allows nutrients to return to the roots. Winterize – blowout sprinkler systems to prevent freeze damage. Don’t wait to schedule an appointment. Unfortunately, Pro Care only offers this service for full-service commercial clients but there are plenty of companies who can help. Avoid hiring fly-by-night sprinkler companies (unmarked trucks towing air compressors). If they break something or fail to do it correctly, it could result in costly damage that won’t be revealed until next spring. By then, you might not be able to find them. Install – fall is the best time to plant trees, shrubs, perennials, & bulbs. You can often find sales at nurseries, as well. Don’t miss the opportunity to put your landscape to bed the right way!